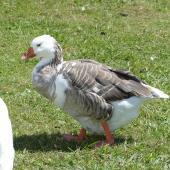 Domestic geese have had a very long association with people since their origin as tamed greylag geese. 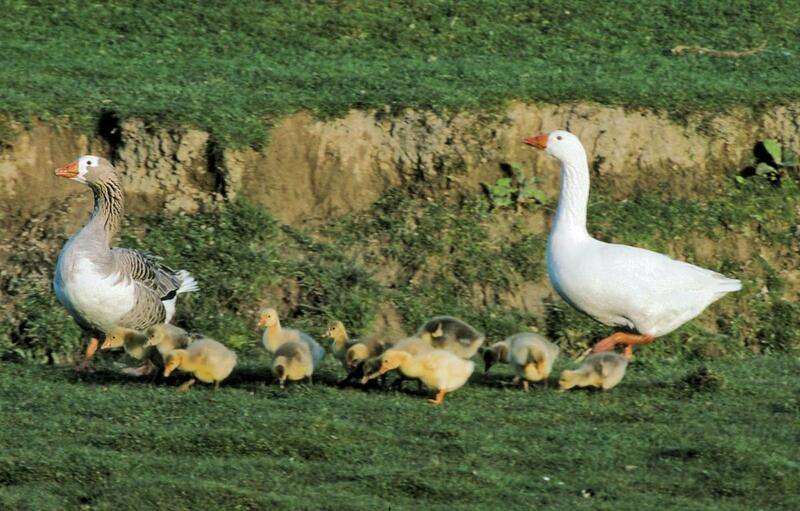 Over the years geese have been bred and kept not just for the meat, fat, eggs and down they provide, but for controlling weeds, fighting and guard duty as well. 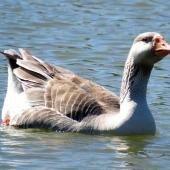 The first birds of any kind introduced into New Zealand were five geese brought from South Africa by Captain Cook and set free at Goose Cove in Dusky Sound. This was not successful and there were just a few attempts by acclimatisation societies to establish them too. 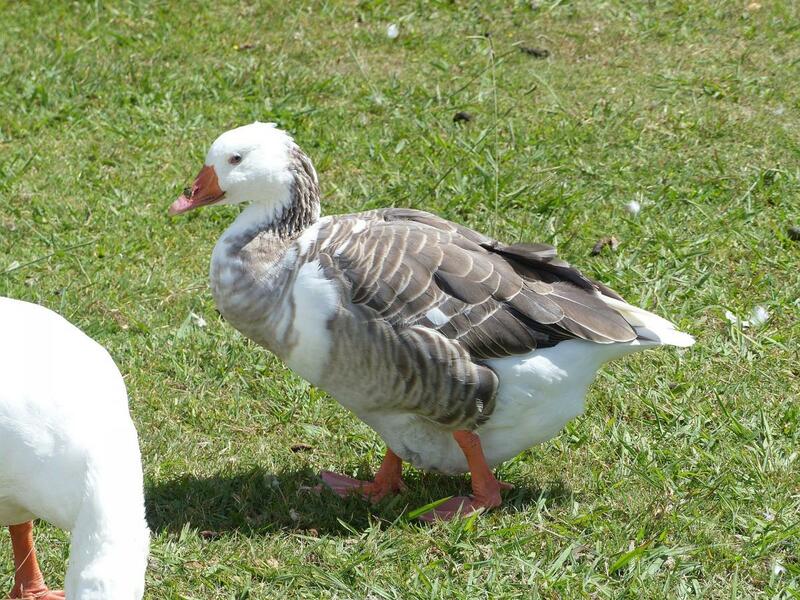 The birds seen in the wild throughout New Zealand have probably originated from stray farmyard geese that are often managed by benign neglect. 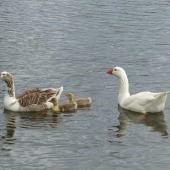 It is difficult to tell which geese on farms and parks are truly wild, and which are more or less domestic, but some flocks are clearly independent of people. 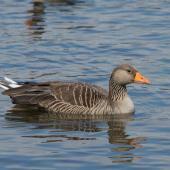 Feral geese are descended from wild greylag geese of Eurasia. 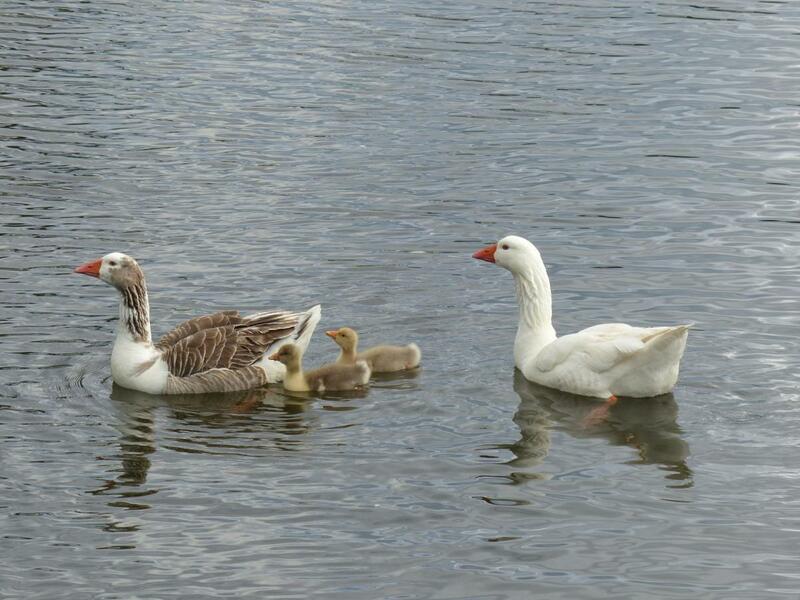 They are large geese; males are entirely white and females have large greyish brown patches, especially on the lower breast and sides and on the neck. 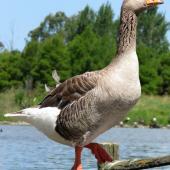 On the sides of the upper part of the neck the feathers are arranged into a series of fine grooves. 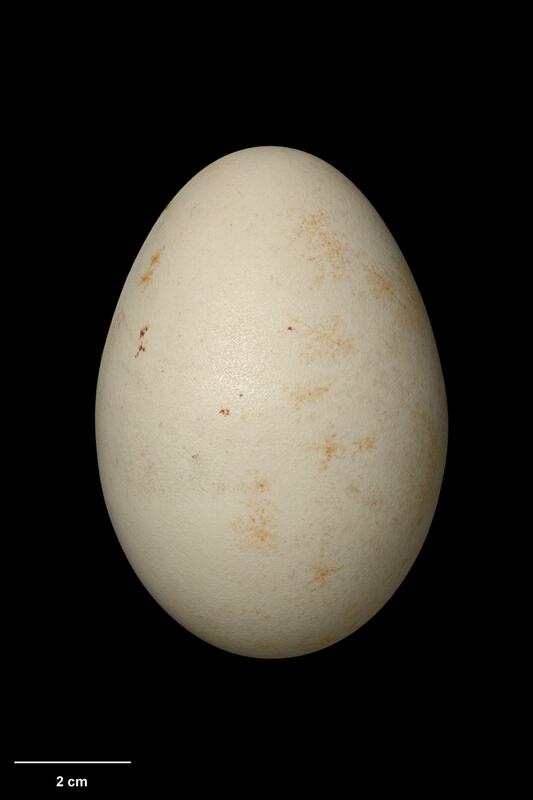 The bill is deep at the base and, along with the feet, usually orange but may be pinkish. The feet are placed well forward and they walk easily. 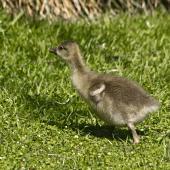 They are heavier at the hind end than Canada geese and have a more upright stance. On the water the rear end sits much higher and the tail is more angled, about 45° from the water. 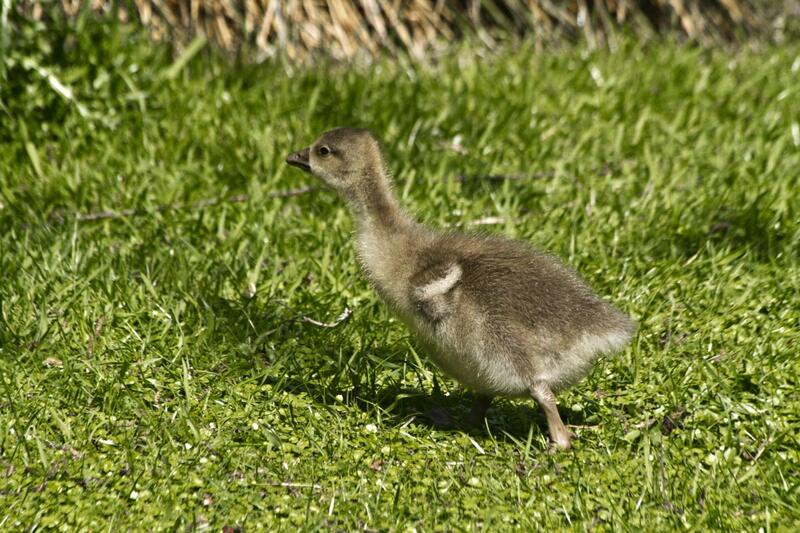 Young goslings are downy and yellow, browner above and paler below. 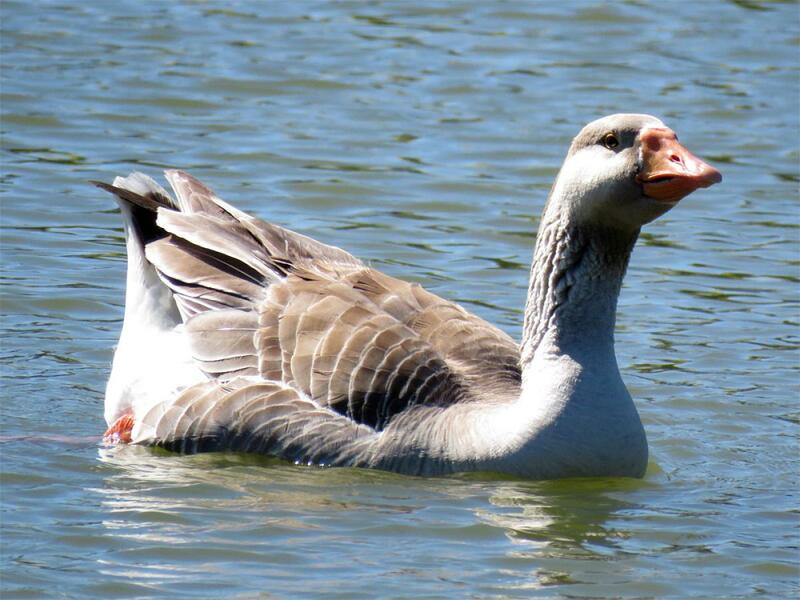 Voice: a loud and resonant slightly buzzing “honk”. Males may also hiss in defence and aggression. 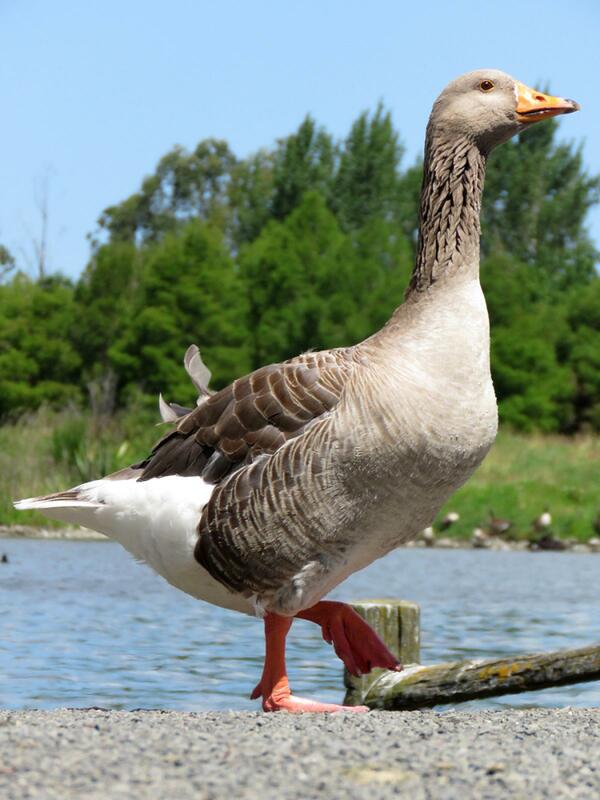 Similar species: male feral geese are much smaller than adult mute swans, and have a shorter, thicker neck and more compact body. 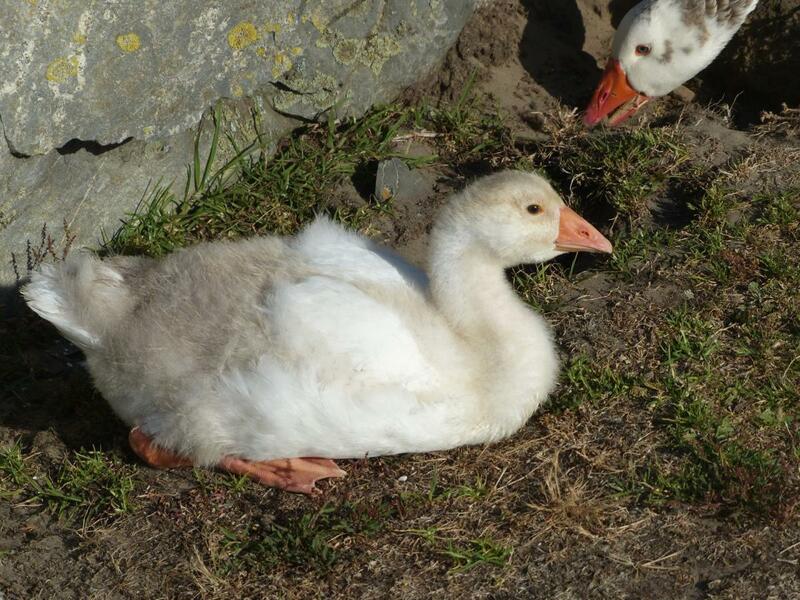 Pale brown juvenile mute swans are equally large, similar in shape and uniformly coloured. 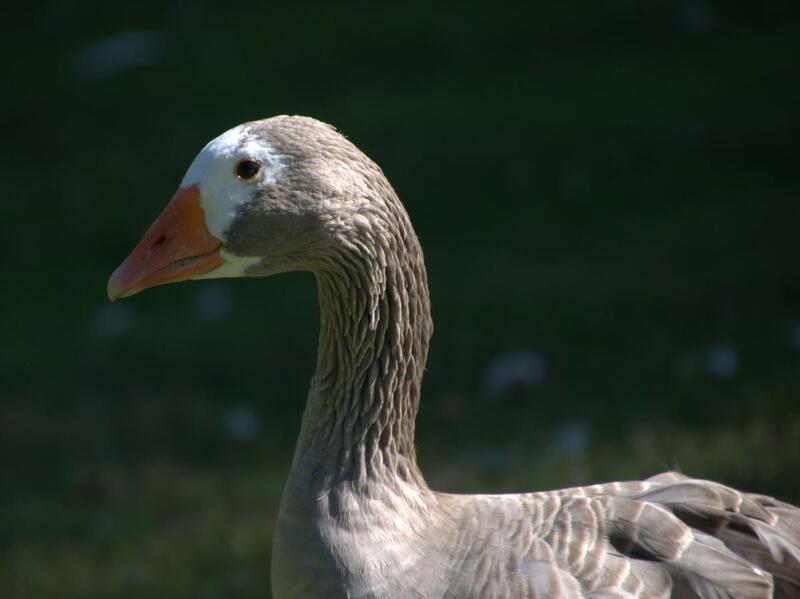 Feral geese are more heavily built than Canada geese, and females do not have the black head and neck nor white cheek patch that is characteristic of Canada geese. 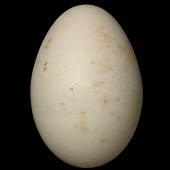 The dove-grey Cape Barren goose is smaller, and has a largely yellowish-green bill and black flight feathers. A white male goose in flight may also resemble a royal spoonbill at a distance as both fly with their necks outstretched, but geese lack the obvious large black bill of spoonbills. 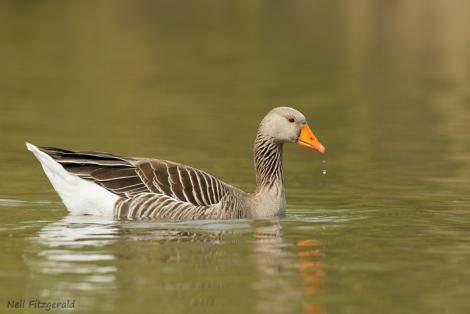 Feral greylag geese are widespread in both main islands but are largely absent from Fiordland and Westland south of Greymouth. 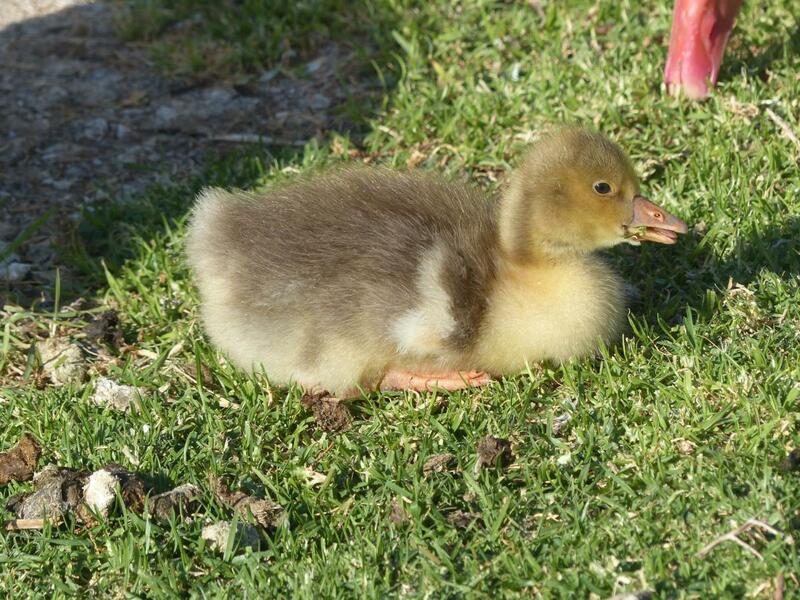 They are also common on the Chatham Islands. 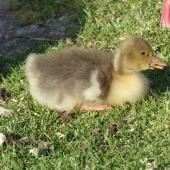 Feral geese are usually seen in urban parks and on pasture grass or adjacent ponds in farmland. 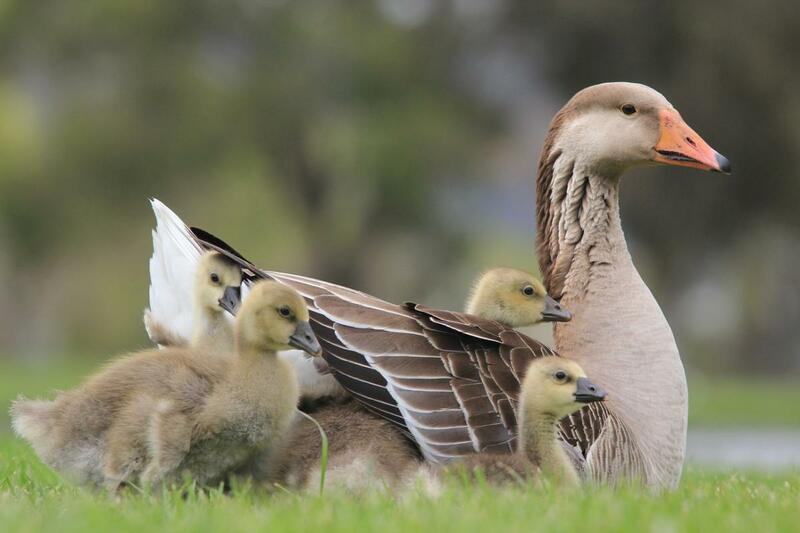 No attempt has been made to assess the population of feral geese in New Zealand and it would be difficult to differentiate truly feral geese from free-ranging domesticated birds. The population is likely to be in the low thousands. 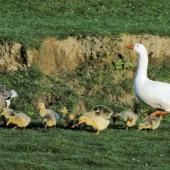 Geese defecate copiously and may foul pasture making it unfit as food for farm animals. 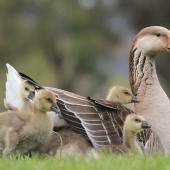 However, flocks are usually controlled to a level where this is not important. 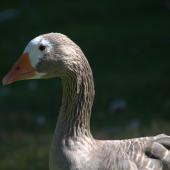 In urban parks aggressive male geese may threaten, chase and even bite people. 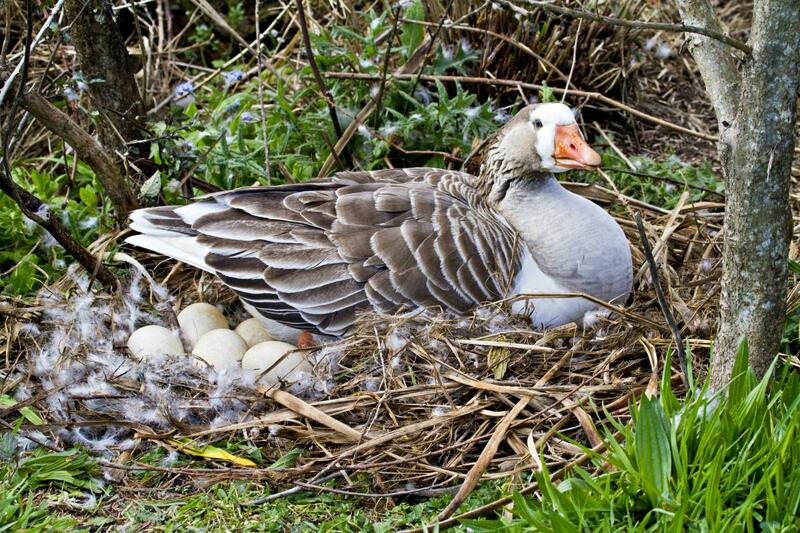 There is no published information on the breeding of feral greylag geese in New Zealand. 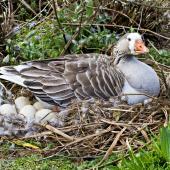 They nest on the ground, often near water, under cover such as long grass and willows. 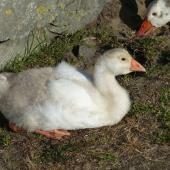 Geese are sociable, resting and feeding in flocks. 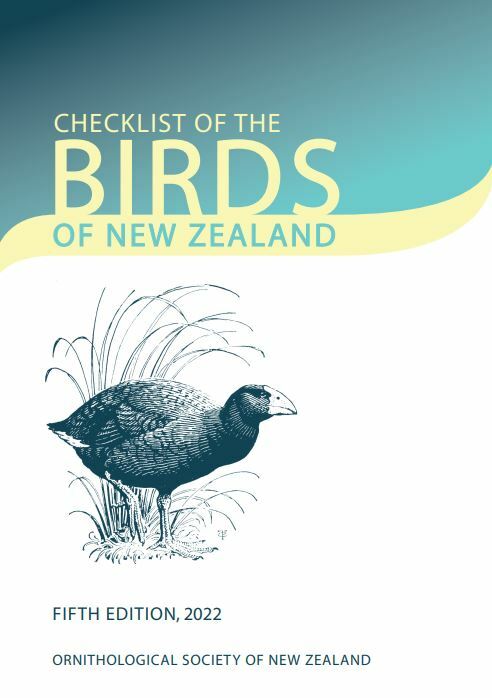 Although favoured as food in some countries they are not esteemed in New Zealand, and so the birds are not often hunted and therefore moderately tame. 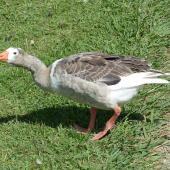 Feral greylag geese graze on foliage and seeds of pasture grasses and herbs often well away from water. Foods include grain, roots and bulbs, a few insects and snails. A bowl of twigs, grasses and other vegetation generously lined with down and placed on the ground under cover. 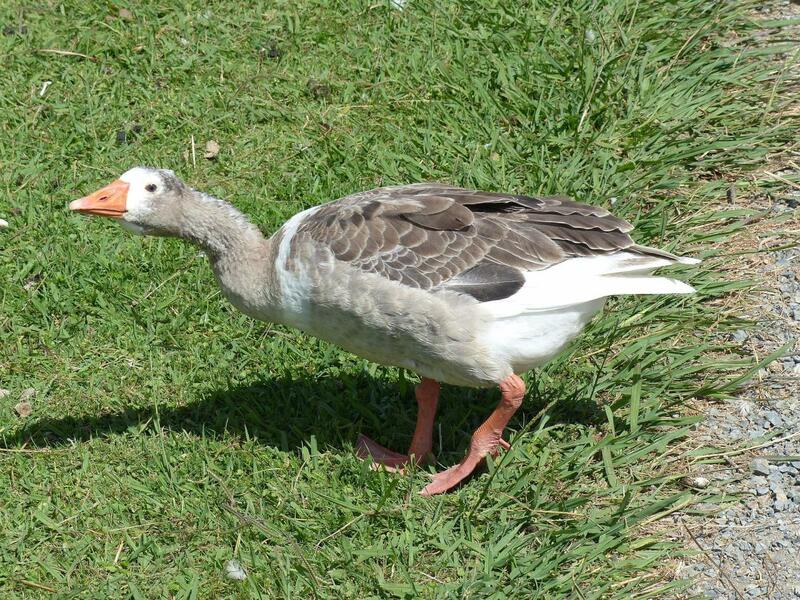 A large long-necked goose with orange bill and legs. 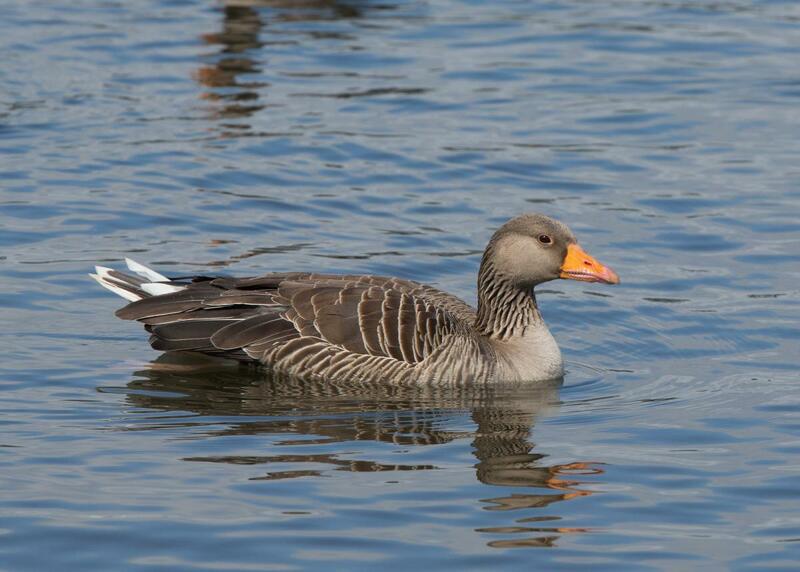 Males are entirely white and females have large greyish brown patches, especially on the neck, lower breast and sides.